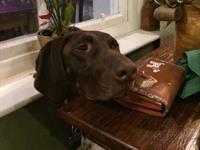 Leroy & Ziva love to go to the Pub with us - here are some of their favourites! 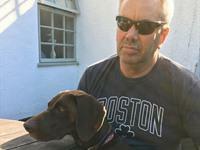 What is in a good Dog Friendly Pub/Restaurant? As dog owners, we love to socialise our dogs out and about after a walk. 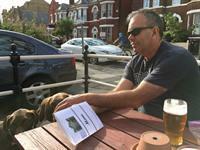 Although Southport itself, does not offer a lot in the way of dog friendly establishments, there are a few around, and we have put together this list of pubs we have either visited or ones recommended on the Doggie Pubs app which you can download to your smart phone. Some of these pubs we have not tried yet, as once we find a good one, we tend to return there. 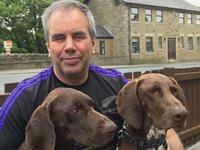 You can also google dog friendly pubs and get a list to assist you. 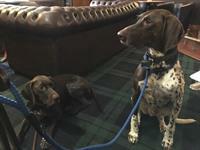 This pub is Leroy & Ziva's favourite place to take us for lunch or dinner. "The drinking room" is set to the side with a lovely carpet and 4 tables and a huge roaring log fire. You can sit here if you reserve a table (and you will need to as it is very popular!) and are taking your dog with you. Otherwise you can sit in the bar. Huge boneo biscuits (yum yum) and smaller treats are available for your dog on the bar. Water bowls are available too. Great menu, a great selection of gins and also real ale on tap. There are plenty of tables outside as well and fabulous grassy areas - overall it is just where a dog want's to go to relax. And the staff are lovely there as well!!!! Located in King Street, Southport. This older pub is great for drinks and cheap eats but beware they stop serving food very early in the evening. Dogs are welcome inside and outside, and they have a roaring fire in the winter inside. This pub is within easy walking distance of the B & B and would be an ideal place to stop in for a spot of lunch or early dinner on the way back from a walk around Victoria Park. If you fancy a walk along the Leeds & Liverpool Canal followed by refreshments at a Pub, this place is great. A great garden for the summer pint! Coal fires and hot food for cooler days. Real Ale Pub - really can't be missed. Great Place. Water and doggie treats provided. Dog friendly area inside is small and near the fire, so lovely in the winter, but booking would be advisable. Plently of tables outside for the summer pint and food in the sunshine. The menu is varied and there is a good selection of drinks. A great place to stop off on your way back from visiting Crosby Beach and the Anthony Gormley's Another Place as you can meander around the back roads back to Southport. This pub is a traditional country pub with a smart interior and amazingly good food, fine ales and is reasonably priced. Friendly, welcoming staff and treats for the dog. Leroy & Ziva love going here - the dog friendly inside area is in the Parlour and you can book or take a chance at a table. Food allergies are catered for well here - all you have to do is ask the staff. Dog friendly in the bar where you can order food. Very popular with the locals and always busy. Located within walking distance of the Formby Point National Trust Reserve. Dog friendly pub for drinking only. Real Ale, Real fires. Dog treats behind the bar. Traditional country pub serving quality cask ales, lagers, fine wines and pub meals. Situated next to the Leeds-Liverpool canal which is ideal for dog walkers. Has their own large field. Dogs can sit anywhere in the pub apart from the main dining area, unless the dog is a guide/assistance dog. Food is served in all areas too. Serves good food and real ale and dogs are allowed in all places in the pub. They provide water for the dogs and even sell dog biscuits behind the bar. 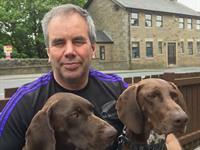 This is a fantastic dog friendly pub located right next to the Abbey Village and the Roddlesworth Reservoir walks. They have a carpark which is for patrons only, but if you park there and tell them you are returning for a drink/food they are more than happy. Small but lovely outdoor area for the sunny days, and warm and welcoming inside on colder days. The staff are dog lovers and the food served is a mixture of english and german food. Whenever we walk here, this is always our place for refreshments and Mark & Slyvie are great publicans as well. Open 10am to 4.30pm (except Mondays) this cafe is located close to the Southport Botanic Gardens. They specialize in beer and pup-cakes for the doggies as well as the usual human food.